Fracking and its role in the UK is a hugely important issue for politicians grappling with the energy challenges we are faced with now and in the future. However, the debate is dominated by industry representatives, politicians and campaigners, with citizens often left watching from the sidelines. Opinion is polarised on each side and the public watches through the lens of media reports, lobbying and public campaigns. At Shared Future, when approached by Cambridge University, we jumped at the opportunity of bringing our experience of deliberative democracy to this crucial issue. Our desire was to explore what happens when a process attempts to move people from ‘raw’ public opinion, to what the American academic James Fishkin describes as ‘refined’ public opinion. That is, ‘opinion after it has been tested by the consideration of competing arguments and information conscientiously offered by others holding contrasting views’. 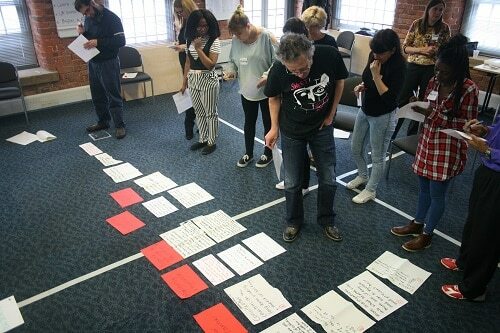 The process we used drew on both deliberation and dialogue to create a space for a diverse group of people to share experiences and stories and in turn encourage them to look beyond set positions to identify the interests and values which underpin them. This is different from other approaches as it moves away from conversations as the trade of monologues and the emphasis of people persuading each other of their own argument. The Fracking Citizens Deliberation aimed to bring together a diverse ‘mini public’ to share their initial opinions, listen to each other and external ‘commentators or expert witnesses’, to ask questions and then deliberate their way towards a set of ‘refined’ conclusions. Surveys and opinion polls give us a clue what individuals think. However they don’t help us understand what citizens will conclude if they are given the time and space to be able to deliberate at length with each other and consider a range of differing perspectives; to share opinions, to challenge and disagree with each other, to appreciate other viewpoints and ultimately come to their own conclusions. the recruitment of a diverse group (in terms of age, gender, ethnicity and educational background) of 15 citizens from central Preston with a range of opinions on Fracking. The establishment of an Oversight Panel made up of the key stakeholders in the Fracking policy community to ensure that the process was fair, unbiased and balanced. Five sessions (totalling some 16 hours), during which participants used a range of approaches to enable them to share opinions, challenge each other and ‘deliberate’ on the issue before producing a set of prioritised recommendations. Usually our Citizens Inquiries are 9-10 sessions in length and although this is preferable we believed there was something to be gained from testing out this more compact format. The use of external ‘commentators’ (agreed by the Oversight Panel) who present to the participants and are in turn ‘cross examined’. 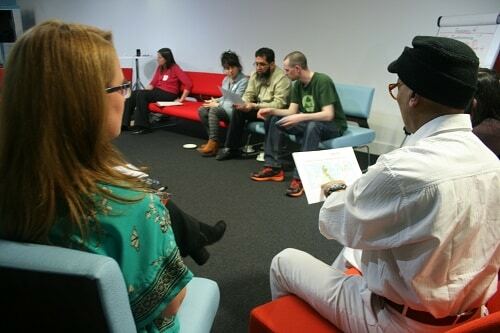 The process we used drew on both deliberation and dialogue so creating a space for a diverse group of people to share experiences and stories and in turn encourage those that took part to look beyond set positions to identify the interests and values which underpin them. Our report is a summary of the process followed and a record of the conclusions of the group. Our role has been purely to facilitate the considerations of the participants. At no point does the report seek to interpret any of the information gathered. As the facilitators of the process we have taken every effort to be impartial and to document a citizen led deliberation about a complex and often highly contested issue of public concern. We thoroughly enjoyed the opportunity to test this approach as a way of both influencing and democratising public policy making on a crucial topical issue, especially at a time when so many are questioning the role of the public in deciding what the future of our country should look like.